These characteristics of coaches of excellence were posted on Bob Starkey’s Basketball Coaching Blog, hoopthoughts.blogspot.com. Editors’ note from Brian: Even though these concepts came from a very successful NFL executive, most of the thoughts can be applied to any level of coaching for any sport. Also, the article is written with male references, but in my opinion, my of the lessons can be applied to man and women, boys and girls. Bill Polian is one of NFL’s best General Managers. He has a proven formula of success and that has transcended from one organization to the next. Hired as the Buffalo Bills GM following a 2-14 season, he soon had the franchise going to three straight Super Bowls. From there he became the GM of the Carolina Panthers where he had the team in the NFC Championship Game in only their second year of existence. From there he took over the Colts organization and one of his first moves was to draft Peyton Manning who would ultimately guide the team to a Super Bowl Championship. 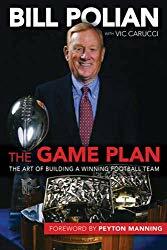 Polion has an outstanding book that I’ve read a couple of times titled “The Game Plan: The Art of Building a Winning Football Team.” For those interested in becoming a head coach, Chapter 2: Deciding on the Decision Maker is worth the price of the book alone as Polion gives great insight to what he is looking for. Below, is a brief look in to what he views important.